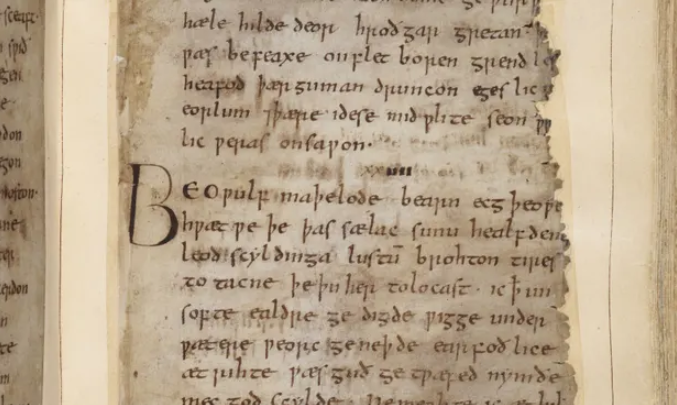 Beowulf, the epic poem of derring-do and monsters, was composed by a single author, research suggests, pouring cold water on the idea it was stitched together from two poems. One of the most famous works in Old English, Beowulf tells of the eponymous hero who defeats the monster Grendel and his mother, thereby rescuing the Danes from a reign of terror, before returning to his homeland and later dying in a battle with a dragon. But the poem has been the subject of a long-running debate. While some argued the work is the product of multiple poets, others – including the scholar and Lord of the Rings author JRR Tolkien – have said the evidence suggests it is a single poet’s work. Recently the debate has resurfaced with some suggesting the poem is the result of two different works joined together – one involving Beowulf’s escapades in Denmark and one involving the dragon. Now a study adds to a growing body of work suggesting Beowulf was composed by just one poet. Writing in the journal Nature Human Behaviour, the team of researchers from the US and China report how they came to their conclusion by splitting the poem into the two pieces around the points where scholars have suggested a split, and analysing small features of the text. While various aspects of the poem, including word use, themes and style, have been explored before, the latest study looks at even smaller features of the text and their patterns of use. These include the use of certain types of pause, the use of different rhythms, and the occurrence of words produced by joining others together – such as “bone-house” (written as ban-hus), which the authors say was used to mean the human body. The team also looked at the use of clusters of letters found within words, which are important for the sound of a poem. The results, derived from computer-based analysis, reveal striking similarities in the way such features were used across both sections of the text. That suggests – although cannot conclusively prove – it was the work of a single poet, the researchers say. By contrast, the Old English epic Genesis, which is believed to be the product of more than one poet, was found to have marked differences, both in terms of the patterns of the pauses and the use of compound words, between what are thought to be its constituent parts. But mysteries remain – not least the identity of the Beowulf author. “The most that can be inferred from the language of the poem is that the author probably spoke the Mercian dialect and probably lived during the first half of the eighth century,” said Madison Krieger, co-author of the study from Harvard University. As well as the findings about Beowulf, the team says the approach also supports the controversial claim that the Old English poem Andreas, whichcharts the dramatic exploits of St Andrew, was composed by a poet called Cynewulf, who is believed to have created at least four other works based on religion. “With Cynewulf, our tests encourage scholars to reconsider a possibility that has not been seriously entertained in the past half century,” the researchers write. Dr Francis Leneghan, a Beowulf expert at the University of Oxford, said the study joined a body of evidence supporting the view that Beowulf was composed by one poet. However, he said it would be useful to apply the analysis to smaller chunks of the text to test the idea that it might have been formed from many smaller poems stitched together, or that some lines might have been added over the centuries by scribes. Leneghan said the authors’ conclusions around Andreas were less convincing, and would stir debate, noting it was thought that the author of Andreas had almost certainly read Beowulf and the works of Cynewulf. “Resemblances between Andreas and the works of Cynewulf are more likely to be the result of imitation,” he said. I'm not a great fan of the poem itself but I recognise its historical importance. Old literature will always be subject to scrutiny and even more recent works have had their origins questioned.